A compact, general purpose moisture meter designed specifically for building professionals and tradesmen to check the moisture content in a variety of construction materials for moisture content diagnosis. Features a 20-LED bar graph within the keypad which displays current moisture levels; green for 'OK', amber for 'WARNING' or red for 'DAMP'. 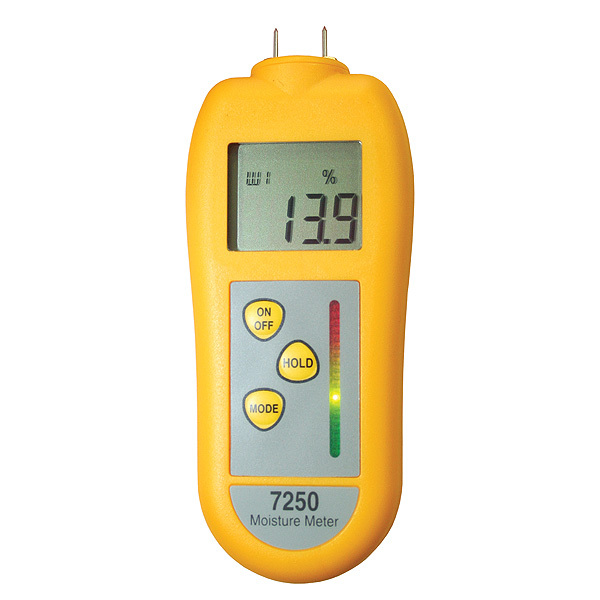 Incorporates a large, easy to read, LCD display with low battery indication. Housed in a robust ABS case. Powered by three AAA batteries that give a minimum of 350 hours battery life. The instrument will power off automatically after ten minutes, maximising battery life. This feature can be disabled by the user, if required. Supplied in a handy-sized, protective zip wallet.